This week we welcomed back our usual 7 to 11 year-old crew, but to keep things interesting we decided to go a bit more abstract for our theme: Colors! Once all our campers arrived and sat down they immediately set to work on their team banners for the week. We got some interesting names based off the colors we assigned them. We started off with The Chocolate Men (Black/Brown), moved on to meet The Red Raspberries (Red), after which were The Orange Peach Peppers (Orange), followed by The Grumpy Greens (Green), side note: the illustrations of angry heads of broccoli were hilarious, and last, but not least, we said hello to The Funny Figs (Blue/Purple). Next was Miss Jennie’s favorite part of the day: Rules!! Miss Jennie loves going over our camp rules which work to keep us all safe in the kitchen while we learn new techniques and experiment with new foods. After rules, we moved on to the campers’ favorite part of the day: Cooking Stations! Our menu for the day was Blackened Tilapia, Brown Gravy over Mashed Potatoes, and Brownies. We all had a splendid time learning new ways to make favorite foods and expanding our palettes with all the spices on the tilapia. The Chocolate Men stayed inside to help plate our meal while the rest of the crew went outside with Miss Kay Kay to play a couple rounds of Refrigerator Tag. Afterwards we all got back together to eat - a close tie for favorite part of the day! I heard rave reviews all around and so deemed Monday a success. Throughout the summer, many campers have been wanting to make pizza and today we finally caved. But if we were going to make pizza, we were going to make everything we possibly could from scratch, so while we didn’t milk the cow or cook our own mozzarella, we prepared our own pizza dough and tomato sauce! On the side we also made Bruschetta and Hawaiian Punch. To give the dough time to rise, we made it during craft time then let it rest before we played Snack Wars! The goal for this Snack Wars was to make something that ran on corn, perhaps it ate corn or used corn in some other fundamentally important way. After teams got to show off their creations we transitioned into Cooking Stations. The campers really enjoyed getting to roll out the dough they made earlier and decorating it with red toppings like pepperoni and red bell peppers. Afterwards, most campers played a couple games of Chefs and Waiters while the Red Raspberries took on the momentous task of getting everything ready to eat. All in all, another fun day where campers learned how to make one of their favorite foods from scratch. On Wednesday, the color wheel spun to orange as we celebrated foods like mangoes, orange bell peppers, oranges, squash, and peaches. 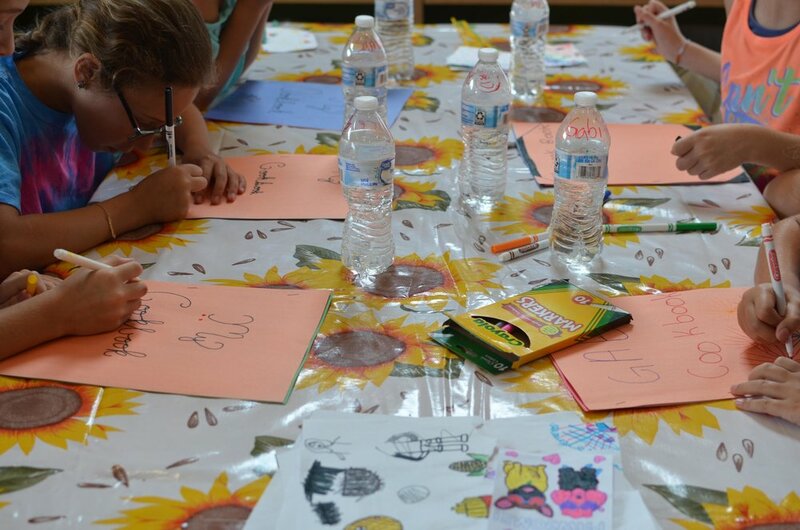 To start out the day, the campers got their creative juices flowing by creating orange-themed restaurant menus. Working in pairs, the had to name their restaurant and craft a three-course meal using orange colored foods. They made sure to incorporate the language and knowledge of interesting cooking methods, like braising or poaching, into their menus. Each team presented their restaurant name and menu with everyone in camp! After sharing, the campers moved on to a riveting round of Jeopardy where the categories were white foods, yellow foods, food chemicals, and orange foods. The campers really knew their foods, and it was a close race between all teams. However, the Final Jeopardy question was tough, knocking the rest of the teams behind the Red Raspberries, who emerged victorious. Next, we moved into the cooking stations for the day where the campers made chicken tikka masala with basmati rice, vegetable pakora, and a mango lassi for dessert. We chose to celebrate orange through the foods eaten in Indian culture and encouraged the campers to widen their palates with new spices and flavors. The dishes were very complex, but they all turned out wonderfully. While the rest of the camp went outside to enjoy a game of Epidemic, the Orange Peach Peppers stayed in to plate the food and pour the mango lassi. Each part of the meal was divine, and it was another colorful day at camp! Moving to the cooler side of the wheel, the color for Thursday was green! To start out the morning, the campers learned about one particular vegetable popular in New Orleans: okra. Okra originated in Africa, and the Bantu word for okra, ngombo, is the origin of the word gumbo, another traditional New Orleans dish. The campers used okra as stamps on letters written to loved ones, which was a great way to share their experiences cooking with their family and friends. 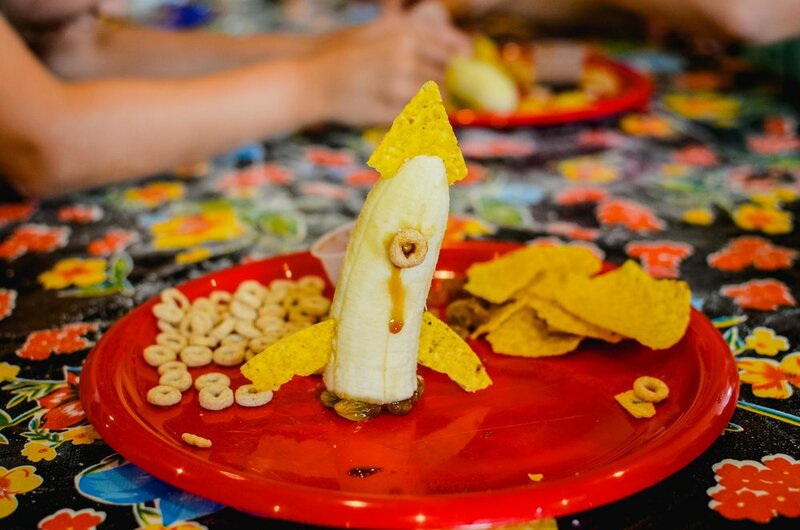 As the letters were drying, the campers learned about the health benefits of nutrients and antioxidants in different foods, which give fruits and vegetables their colors. 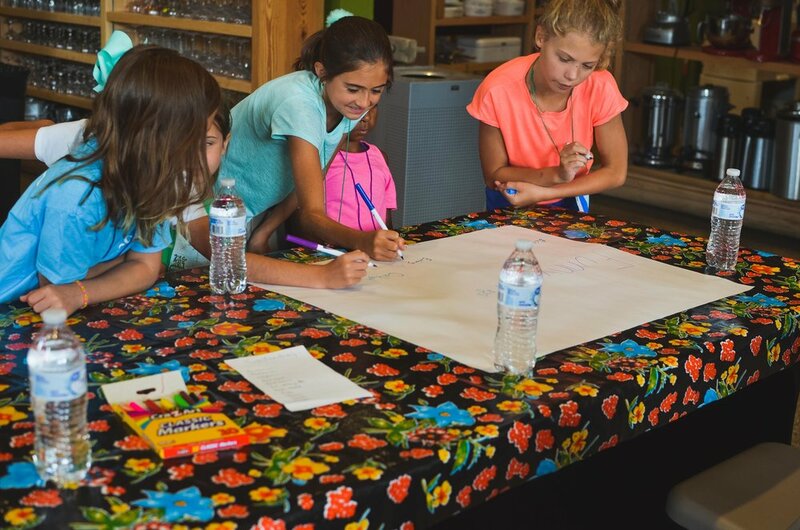 To learn more about the different antioxidants in various foods, the campers enjoyed a rousing game of Antioxidant Bingo. For each bingo, they yelled “antioxidant” and enjoyed green tea Pocky sticks as prizes. The foods for green day were inspired by Japan; the menu included sushi with fillings of crab, cucumber, avocado, and cream cheese and green tea pound cake muffins for dessert. While the Grumpy Greens were plating, the other campers enjoyed a game of Chefs and Waiters. 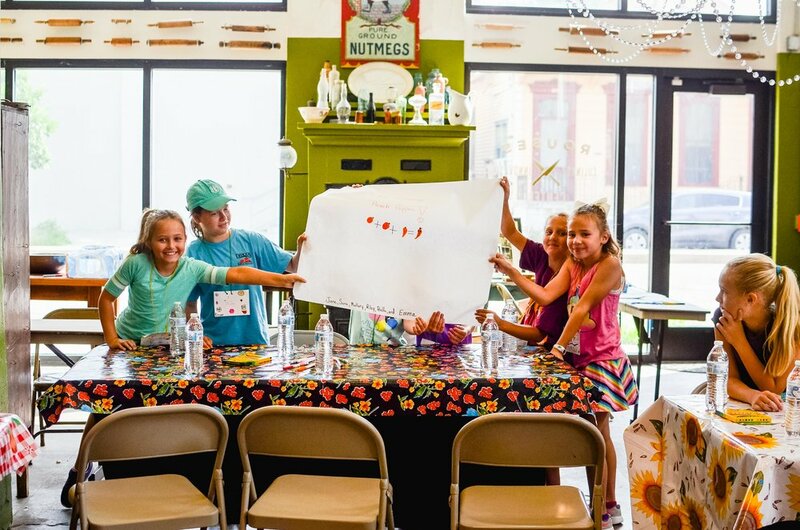 Giving the campers agency in their sushi filling choices, as well as teaching to roll the special treat was a lot of fun, and everything turned out delicious! Green day was a success! To close out the week, we celebrated with the colors blue and purple! 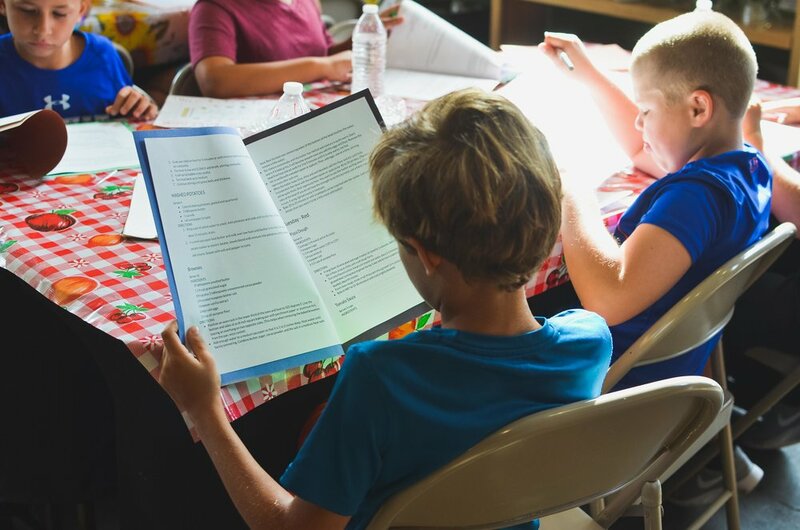 The campers received their cookbooks on this day containing all the recipes from the week. For each recipe, the campers made notes about things they would change, things they really enjoyed, and things that weren’t for them. Then, they had time to collect signatures from their friends at camp. Next, the campers moved into tasting stations where they tried blue cheese, mascarpone, and mochi. They made sure to think about the flavors involved as well as how they would use these foods in dishes they might make at home. 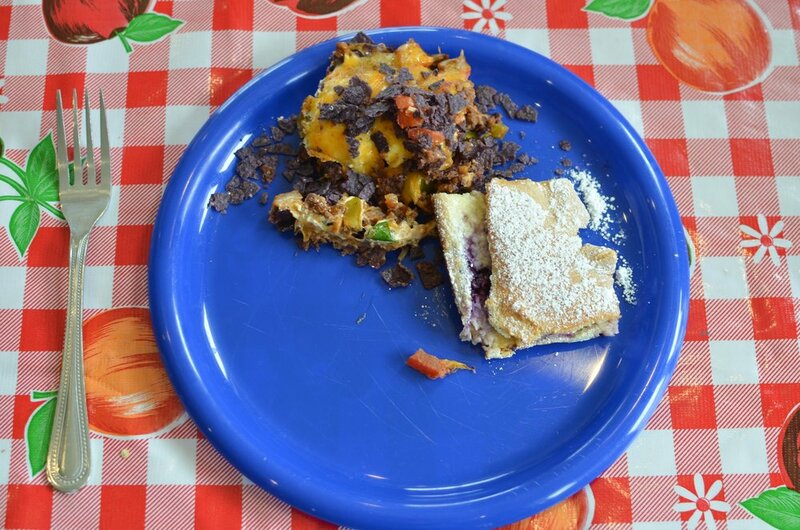 Then, they moved into cooking stations where the foods for the day were a Mexican blue corn chip casserole, beet chips, and a lemon blueberry cheesecake bar for dessert. Most of the campers headed outside for a game of Epidemic while the Funny Figs worked hard to plate the delicious food. Colors week was a huge success with lots of interesting, palate pushing food. 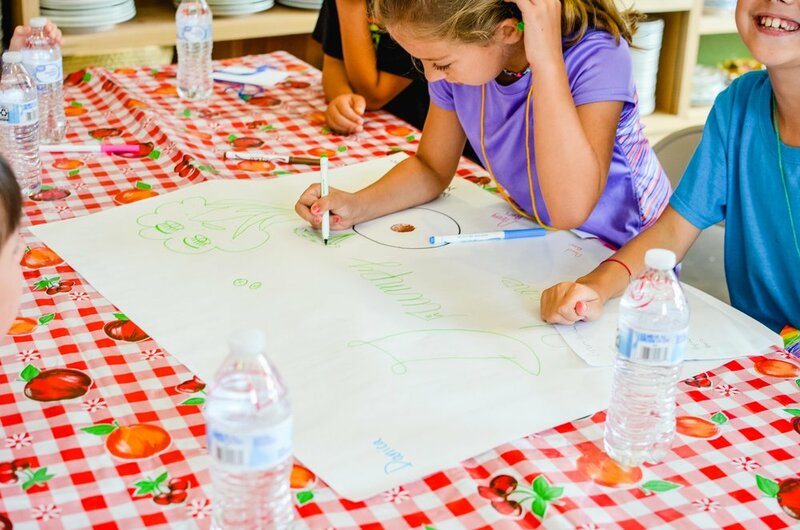 The campers enjoyed thinking about food in new ways, learning new cooking skills, and making new friends!